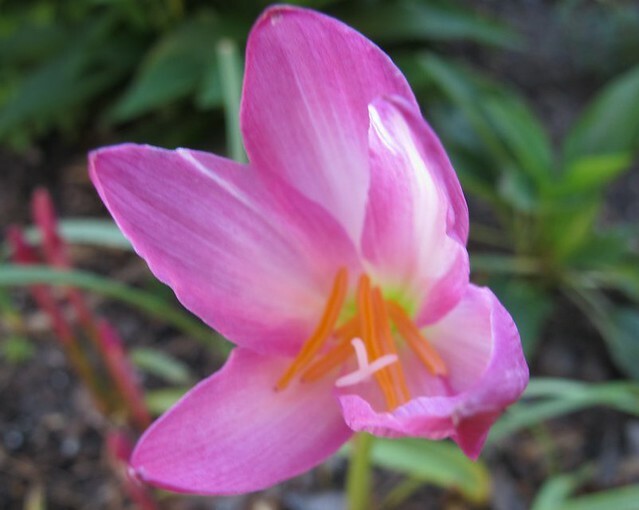 When rainlilies (Zephyranthes spp.) began to bloom in the back garden early last week, albeit sparsely, I could only shake my head and laugh at their folly/confusion. No rain had fallen here at Wit's End for almost three months. The Head Gardener and I have been at our wits' end and hanging on by a thread for about that long. Our countenances were far more woeful than that of this little cherub. And then ... then came Thursday afternoon, when the heavens opened and precious, lifegiving rain began to fall. The Katy area received approximately one inch of rain over several hours. By Friday afternoon, new bud stalks had emerged throughout the gardens of Wit's End. And as Garden Bloggers' Bloom Day approached, blooms began to open. And I wonder ... did they know somehow that rain was coming? There are many other blooms to be found in the garden but it seemed only appropriate to celebrate the rainlilies on this May bloom day. To see what's blooming in other gardens around the world, visit May Dreams Gardens. Oh so pretty, Cindy! I am so glad you got an inch of rain, even though much more is needed. May May bring yet more. 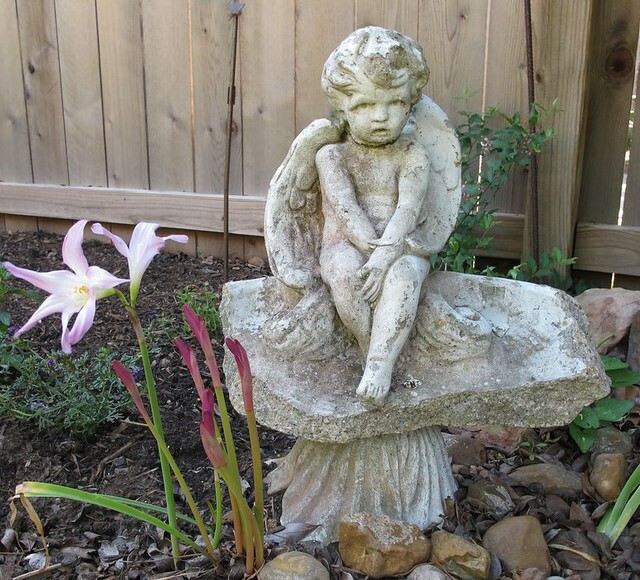 You & the HG must make note of when the rain lilies start blooming to see if they are accurate meteorologists. They are so pretty. I love rain lilies! I had some that have gotten very sparse...maybe I should move them to a better spot so I can have something like you do...wonderful. 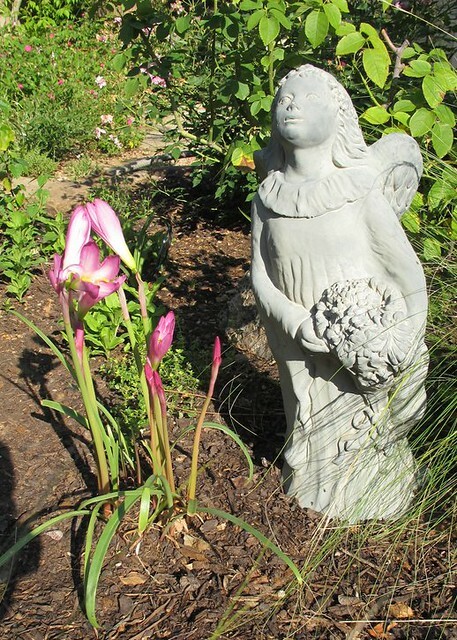 Your Blog Photo of your garden takes my breath away each time I see it. That is what I want my garden to look like! They are quite nice. Almost a surprise with their bare stems! Those rain lilies sure did respond fast! They are beautiful. I'm glad you have gotten some much-needed rain. Lovely photos. I especially like the fifth one. 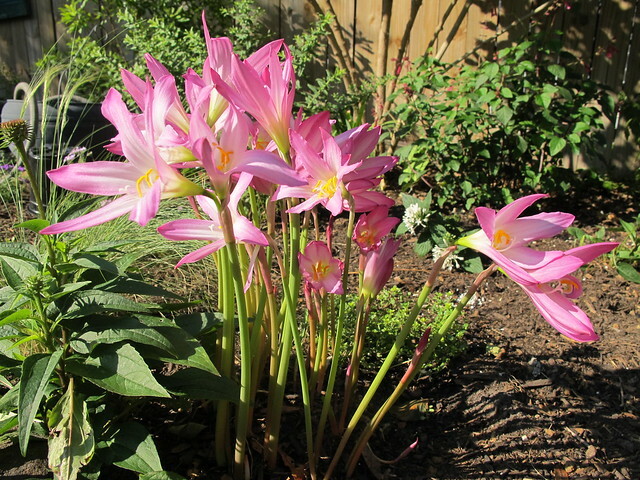 Wow, those are really pretty rain lilies. What kind are they? I'm so happy you finally got some rain (unfortunately we only got a smidgen). I visited my family for Mothers Day and could tell how little rain you all had gotten - very unusual for you guys. Let's hope June brings us both some rain (it CAN happen!). 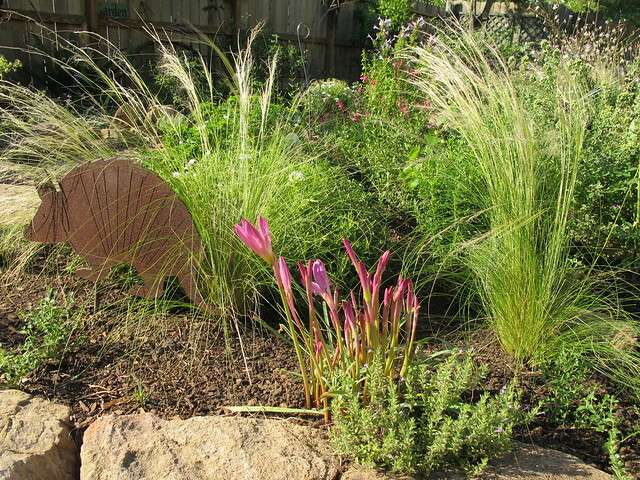 Rain Lilies are appearing everywhere in Texas garden blogs - ain't it great. Sure hope we get cause for another round of blooms in the next couple of weeks! I wish we could share out the rain more evenly around the country. Still things look lovely down there in Katy. Mine were doing the same thing, and before the rain we got! That was weird, but glorious! Do you know which one is your pink? I've got so many intermingled now that I can't keep them straight. I have the pink with the slightly crinkled petals that was sold to me as H. robustus (but will go look that up). Not sure about the whites coming up. But glorious all the same! Thanks, y'all, for your visit & comments! 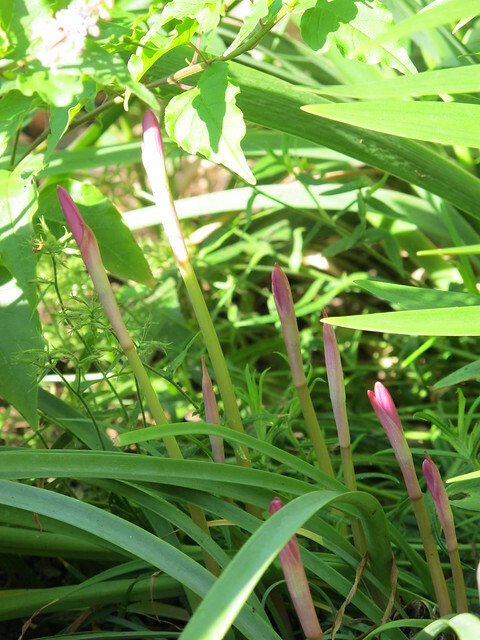 The rainlilies are Habranthus species, which reseed. I let some of them go to seed each time they bloom and then scatter seeds where I want to see more. I have some Zephyranthes species, only a few of which bloomed last week. 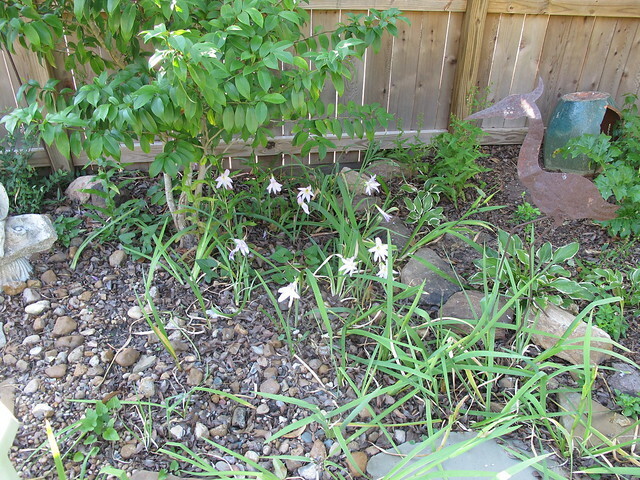 The white rainlilies have NEVER bloomed for me. Wait, I take that back ... I think I saw one flower last year. I forgot to add, I'm not sure exactly WHICH Habranthus species the rainlilies are. I think some of them came from local plant sales and some from friends.